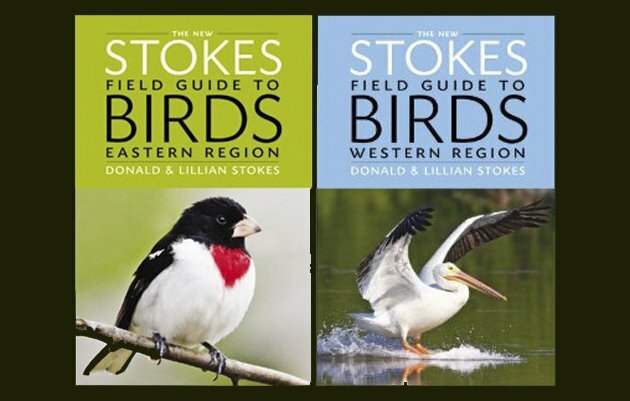 The Stokes have published two new regional field guides! And, you know what that means, time to talk seriously about field guides for birds, a topic guaranteed to get the members of our tribe articulating opinions with great gusto and certainty. Here are the ground rules for this review: This is not a contest about which is the best bird field guide. I believe that for every birder there is a field guide and for every field guide there is a birder. Our field guides are very personal. The question is not which is the best field guide, but which guide works the best for you. So, I will be looking at The New Stokes Field Guide to Birds, Eastern Region and The New Stokes Field Guide to Birds, Western Region, both by Donald Stokes and Lillian Stokes, with an eye for (1) features that are unique, (2) features that are helpful for bird identification in the field, (3) organization and accessibility, or, in other words, how quickly does it take to find a bird description? I will be comparing various features to those of the latest editions of the Peterson, Sibley and National Geographic regional field guides, all guides that use drawings to illustrate birds. There are notable photographic field guides, but with the exception of the Crossley ID Guide, which is regional but not a “field” guide, these guides do not have regional counterparts (yet!). I think it is important to recognize that a good regional field guide has slightly different goals than a comprehensive field guide, including a narrower focus on birds common in the region, conciseness of information, and a size that will fit in your pocket. I also recognize that, as I said above, this is a topic that many birders are passionate about, and I hope you will share your opinions about what features you think make the best regional guide. Now, on to the books. Based on The Stokes Field Guide to the Birds of North America, published in 2010, the New Stokes regional guides aim for more portability and ease of use in the field. The Eastern guide covers 545 species and the Western guide covers 636 species. The cover designs, like the parent book, are cheerily colorful; the Eastern guide is green, featuring a photo of a Rose-breasted Grosbeak, the Western guide is blue, featuring a White Pelican just landing onto the water. Both guides measure 5.5 inches wide by 8.5 inches in height, with the Eastern guide .8-inch deep and the Western guide 1-inch deep; the Eastern guide weighs 1.7-lbs., and the Western guide 2-lbs (I know, I measured and weighed them). This makes the books just a little bit larger but no heavier than National Geographic and Peterson’s most recent regional guides. For me, this is too large for my pocket (actually, all three titles are too large), but fine for my field backpack, and probably a suitable size for the pocket of a larger person. These are photographic field guides in the truest sense of the word, and I was struck immediately with the way the Stokes have organized and presented the over 2,000 photographs in each volume. A typical page is 60 percent photographic and 40 percent text, including a small range map. Photographs are set in cleanly delineated grids, with the images of each bird sized similarly and all the birds facing or flying in the same direction. When you think about it, this is pretty remarkable; even with all the excellent bird photographers available, it must have taken hundreds of hours to locate good quality photographs in which the bird looks towards the right. Many of the photographs are by co-author Lillian Stokes, with other photographs by over 100 nature photographers who are credited in the back of the book. The consistency of design gives each page, and the book as a whole, a sense of order and balance. It also makes it easy to compare the birds in their differing plumages since there is no distracting effort in trying to align different postures and sizes. Each photograph identifies the age (adult, juvenile, 1st winter, 2nd winter), time of year (winter or summer), the state in which the photograph was taken and the month. I wish I could tell you the number of photographs for each bird, but I can’t. Each species is depicted in as many or as few photographs as is necessary for identification. 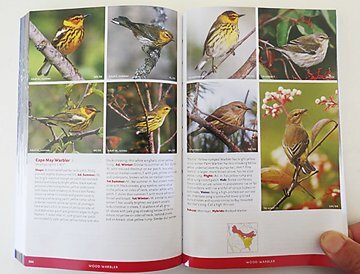 So, for example, Ruby-crowned Kinglet gets two photographs and half-a-page of space, and Cape May Warbler (see photo above) gets seven photographs—including adult male summer, adult male winter, adult female summer, first-winter male, first-winter female–spread out over two pages. Yes, the Ruby-crowned gets less attention because, let’s face it, one Ruby-crowned looks pretty much like another except when the male’s red crown patch flares up. Many species, particularly those with seasonal and yearly differences in appearance like gulls and hawks, are allocated two-page spreads and multiple photographs, including flight photos. Red-tailed Hawk wins the prize for the most coverage, with 23 photographs and 4-pages in the Western guide. This is 12 more photographs and two additional pages to what appears in the Eastern guide; the additional material is used to illustrate western subspecies, including Harlan’s Hawk. (Attention to regional differences like this is probably why the Western guide is thicker than the Eastern guide.) Care has also been taken to place birds that are often identification challenges next to each other. King Eider to the left, Common Eider to the right. Swainson’s Thrush opposite Gray-cheeked Thrush. 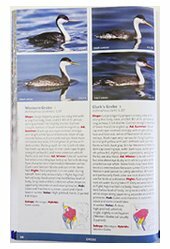 Western Grebe right next to Clark’s Grebe in the western guide (pictured left). Shape in Flight: Very large, heavy-bodied, broad-necked falcon, tail very broad and moderately long, wings fairly long and broad-based for a falcon; outer wings taper to blunt tip. Tail length = wing width; wing length 2-2/3 x width. F. substantially larger than m. Ad. In Flight: Light, gray (most common and widespread), and dark morphs as well as intermediates. …. Gray morph: Below, body whitish, heavily barred and spotted darker; cheek bar evident; underwing coverts whitish with dark barring, making them slightly darker than indistinctly barred grayish primaries and secondaries, primaries tipped blackish; tail finely barred. …. Shape Perched: Heavy-bodied, with broad chest and sometimes hunched back; legs fully feathered and short, adding to compact muscular shape. Head small, rounded, with relatively long deep-based bill. Tail moderately long; wing tips extend 2/3 down tail; primary projection past tertials fairly short. …. Flight: Slow, powerful, deep wingbeats. This is only half of what is on the page about what a Gyrfalcon looks like in flight and perched. In addition, descriptions are given for plumages of light and dark morphs in flight, all three morphs perched, and all forms of juvenile plumage. I think the quotes do give an idea of the high degree of detail incorporated into each species description. It is a very different approach from the field-mark system made famous by the Peterson guides, in which identification is based on two or three distinguishing characteristics. In the current, 6th edition of the Peterson Field Guide to Birds of Eastern and Central North America, Gyrfalcon is described simply as: “A very large Arctic falcon, more robust than Peregrine. On perched birds, wingtips do not reach near tail tip. Thinner mustache. There are brown, gray, and white color morphs”. The Sibley regional guide description, on the other hand, incorporates comparative and behavioral characteristics, noting that the bird can be confused with a Northern Goshawk, but a Gyrfalcon will never fly into the woods while a Goshawk will, and that a Gyrfalcon is a solitary bird who “Hunts from perch or in low level flight, using ground contours for cover; less often from high in the air”. Every one of these field guides is excellent. It really is all a matter of what type of descriptive avian information works for you when you are identifying a bird. Species description is followed by listings of subspecies and hybrids. Subspecies information includes geographic range and characteristics, information not found in the Peterson or Sibley regional guides and found to a lesser extent in the National Geographic titles. Range maps by Paul Lehman indicate, in four colors, winter range, summer range, year-round range, and migration route, plus dotted lines for past rare occurrences; maps are provided for all regularly occurring North American species, not vagrants or accidentals. One very helpful feature are the “Identification Tips” offered for groups of birds. These light blue boxes paint an overall view of the group as a whole and articulate guidelines for differentiating species within the group. The number and length of “Identification Tips” vary. For some groups, there is one large box covering all species (gulls, warblers), for other groups (flycatchers), the boxes are more specialized and strategically placed near the relevant species (pewees and empids in one box, kingbirds in another box). In addition to providing a pathway for identification, the “Identification Tips” occasionally talk about bird behavior, a feature not usually included in the individual species descriptions: Spizella sparrows tend to fly high when flushed, Robins eat berries in winter. As far as I could tell, the only way to locate these id tips is to browse through the book, so I do request that subsequent editions include the tips in one of the indexes. Speaking of indexes, it’s time to take a look at accessibility. How easily is it to locate the species descriptions I’ve been discussing? Accessibility is particularly important in regional field guides, used in situation where birders don’t have the time to figure out complex systems. The regional New Stokes Field Guides to Birds offer several different ways by which birders can quickly locate species they want to read about or identify. A “Quick Alphabetical Index” on the inside front cover offers quick entry to bird groups. The inside table of contents lists groups in bands of color that are keyed to colored tabs at the bottom of the pages. These colored tabs also contain the name of the bird group or subgroup, to help while you’re browsing; so, if you’re looking for Marbled Godwit, blue-green is for shorebirds, and “Godwit” can be found right after “Curlew” and before “Turnstone”. The species descriptions are arranged according to the American Ornithologists Union (AOU) order current for 2012, with the order of individual species occasionally adjusted for the comparisons described above. A detailed index is located at the back of the book, listing scientific and common bird names. The index is comprehensively excellent, including notable subspecies such as Dusky Seaside Sparrow and Sooty Fox Sparrow. Subspecies are not listed in the indexes of the Sibley or National Geographic regional guides, and only selectively in the Peterson guides, a drawback to birders who are interested in identifying them. In fact, the Stokes indexes would be perfect if they also listed notable hybrids, such as Brewster’s and Lawrence’s Warblers. Another item for the next edition wish list. Additional helpful features include a “Key to Bird Accounts” on the very first page, photographs diagraming the parts of birds on the very last page, and keys to important abbreviations and range map color codes on the inside back cover. Since I’m the kind of birder who is always forgetting that blue means winter, I really liked having the map key at my fingertips. The five page introductory section on “How to Use This Guide” succinctly explains how to read the species descriptions, especially the parts on shape and plumage. I was pleased to receive my review copies of the regional field guides right before a trip to California, which gave me an opportunity to try out the Western guide in the field. Let’s face it, you can examine a field guide ad infinitum in the comfort of your living room, or even your backyard, and it won’t give you a clue how helpful it will be when you’re facing a sea of strange western gulls on the sands of Ballona beach, outside Los Angeles. 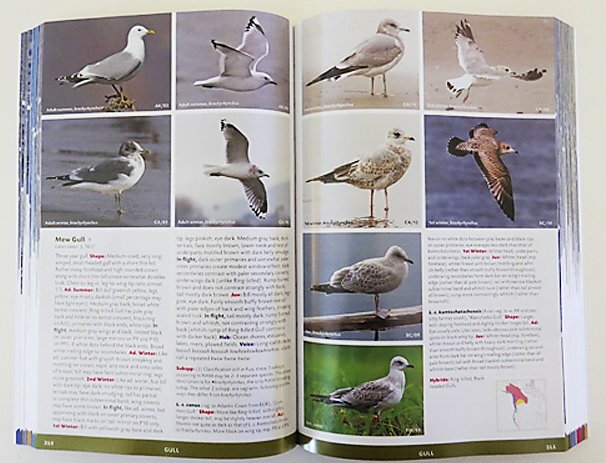 I found the guide extremely useful for identifying these gulls. I consulted the photographs and shape descriptions as I observed them, and studied them further, with the full descriptive material, afterwards, as I examined my photographs. I was quickly able to sort adult Western Gulls out of the flock, large, dark-winged birds with thick bills and dark-pink legs. Heermann’s Gull was a little trickier; I couldn’t believe that the dark brown slender gulls plopped down in the sand were the lovely gulls I had seen in my Peterson guide. But, there it was in the Stokes, seven photos of first, second, and third winter Heermann’s Gulls, dark grayish-brown with bills ranging from pink to dark red. I did finally find a lovely adult Heermann’s late one day at Santa Monica and promptly fell in love with it. Two life birds down. Mew Gulls proved to be trickier, not a life bird, but one I had not seen for a while. Focusing on shape, I finally found a small-headed, slender-billed, sweet-looking adult Mew Gull on Dockweiler Beach. When my brief trip ended, I had eight life birds, all identified with my Stokes. As a birder brought up on field guides with illustrations, I was surprised at how helpful the photographs were in identifying birds that were new to me. With the depictions of various plumages presented side by side, I was able to visually sort through shapes, colors, and patterns. Sadly, I was forced to tell myself time and again that I was not looking at a Clark’s Grebe. But, I could recognize the shape of a Black-vented Shearwater flying over the Pacific at Ballona and tease out the plumage of a Sage Sparrow running through sagebrush in Antelope Valley. For me, using The New Stokes Field Guide to Birds, Western Region was a happy experience. Lillian and Donald Stokes are well-known in the birding and naturalist worlds, the authors of many books including Stokes Field Guide to Warblers, the 3-volume Stokes Guide to Bird Behavior, Stokes Field Guide to Bird Songs: Eastern and Western, a CD set, and my personal favorite, Stokes Beginner’s Guide to Shorebirds. 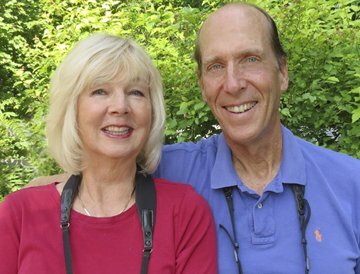 They also author a popular birding blog featuring Lillian’s enviable photographs of birds, butterflies and landscapes. The New Stokes Field Guides to Birds, Eastern Region and Western Region continues and expands on their record of excellent books about birds. I was surprised and impressed by the depth and authority of the species descriptions. I expect a regional field guide to contain abbreviated descriptions, but the Stokes guides replicate the material of its parent North American guide in full. There is a trade-off, however. In exchange for keeping all this material, the number of birds in each volume is limited to species most likely to be seen in the region. Vagrants and accidentals need to be researched in the parent volume. Exotics not listed in the ABA checklist at the time of writing are not included in the parent guide nor the regional guides. It is a tricky balancing act, this composition of a field guide. You lose your rarities, you gain your subspecies. I think these field guides will be a valuable asset to many birders’ field kits and libraries, especially if they have not yet invested in a photographic guide. Beginning and intermediate birders will find the abundance of clear, well-printed photographs of male and female birds, juvenile and adult, perched and flying, extremely helpful in the field, and the emphasis on shape a good teaching tool. The detailed translations of bird calls, songs, and trills will be very useful as spring approaches. Experienced birders will find a lot of useful material in the detailed shape, plumage and subspecies material. Yes, you can find all that in the North American volume, but can you carry it around? This book weighs almost 3 pounds! And, I think all birders will get joy from using a book that is so well designed. There are so many small touches here that may not be noticed till you start using the book, little things like the way the color of the font of the species name matches the color of the chapter coded tab. They all add up to two books written and created with intelligence and exacting care. I said in the beginning of this review that I believe for every birder there is a field guide and for every field guide there is a birder. Sometimes, for every birder there are two, even three field guides. If you have not yet used a Stokes photographic field guide, I highly recommend trying one (or two) of these titles, which will be on sale the last week of March. Meanwhile, let us know what features you think are most important in a birding field guide. And, how many field guides do you think a birder should own? The New Stokes Field Guide to Birds, Eastern Region by Donald & Lillian Stokes. Photographs by Lillian Stokes and Others; Maps by Paul Lehman; Maps digitized by Matthew Carey. Little Brown and Company, March 2013. Size: 8.8 x 5.8 x 1 inches, 1.7 lb. The New Stokes Field Guide to Birds, Western Region by Donald & Lillian Stokes. Photographs by Lillian Stokes and Others; Maps by Paul Lehman; Maps digitized by Matthew Carey. Little Brown and Company, March 2013. Size: 8.8 x 5.8 x 1 inches, 2 lb. photographs provided by Lillian and Donald Stokes. It is very easy in photo editing programs to reverse an image to make a left-facing bird face the other way. Click a button and presto! These books sound like they’ve come a long way from the original Stokes guides, which I was unimpressed with at best. Looking forward to checking them out. Thank you Donna for the excellent and thorough review. The New Stokes Field Guide to Birds: Eastern and Western Region are based on our highly acclaimed national guide, The Stokes Field Guide to Birds of North America and are completely different than our older The Stokes Field Guide to Birds, Eastern and Western Region which were published in 1996 and are now out of print. These new guides have all new photos, text, maps, and format with all the latest information, plus they are portable. We hope you all will enjoy them. They look great and I’m interested in adding them to our library! I’m just wondering how current these guides are in reference to the ongoing updates in ABA splits and joins? Kudos! April, the books are current as of the 52nd Supplement of the AOU Checklist, which the ABA checklist follows. So, it includes Pacific Wren, the name change from Common Moorhen to Common Gallinule, and the extensive taxonomic changes in the warbler family, but it doesn’t include the 2012 split of Xantu’s Murrelet to Scripps’s Murrelet and Guadalupe Murrelet. It also doesn’t include the recent ABA additions of exotics such as Nanday Parakeet and Purple Swamphen. I think it’s tough to find a print field guide that is totally up-to-date, just because print publication still takes a while and and birding classifications are constantly changing. As I replied to Rick, these regional versions are updated from the parent North American edition, which is a very good thing. Where Are You Birding This Final Weekend of February 2011?